Dog owners are most likely aware of dog toys being advertised all over pet stores. They come in various shapes, sizes, and designs depending on the type of toy you buy. Not surprisingly, dogs love them. But aside from being a plaything to keep your dog occupied when it’s bored, is it something that you must really buy? Whether you believe it or not, dogs actually NEED to have the best dog toys in their little toy box. Dog toys aren’t just for enjoyment – they’re also for personal growth. In fact, they’re probably as important as dog treats. When a dog is in his younger years, he has a strong inclination to bite stuff. This is because he’s still in his teething stage and is exploring his own teeth. In order for his teeth to become sharper, a good chew toy is essential. As a dog owner, you have to make sure that your dog gets the best durable dog toys to take on all that chewing. When your dog is in his teething stage, he will bite pretty much anything. This could range from your sofa to your cell phone. In this stage, your dog will try to find something to bite so that he can practice his jaw. If you want your belongings to remain intact, then you should buy durable dog toys to keep your dog entertained. If your dog is an aggressive chewer, then you will need to buy the best dog toys for aggressive chewers. These are usually hard chew bones that are pretty challenging for most dogs, even for the bigger breeds. Most dog breeds, such as frisky poodles, German shepherds, or Dobermans, are known to have a lot of pent-up energy. With all that pent-up energy, dogs may actually make a lot of ruckus in the house, running around jumping on stuff and doing various other activities if they get bored. It’s really important that your dog has something to help him relax. One of the best ways to solve that is to buy the best dog toys for boredom. Toys allow your dog to get some exercise. Exercise is really important for your dog so that his body remains fit and strong. Of course, it’s not every day that you can bring your dog out for a walk in the park. Therefore, the next best thing you can do is to buy a doggie ball or any other toy and give it to your dog to play with. Just like how a baby bonds with his/her parents through playing, a dog and his owner also bonds in the same manner. There are toys that allow you to engage and interact with your dog. These include balls, dog frisbees, plush toys, and many more. Now that you know how important dog toys, how can you choose which one to buy? 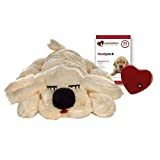 There are a ton of dog toy products across various pet stores, and it may be really hard to pick which one you think your dog will like. As such, we have compiled a list of the best dog toys for you. We’ve also included a buying guide to help you easily make your pick. Age is one of the most important factors to consider when you buy a dog toy. Let’s take a three-week-old puppy for example. During this stage, a puppy still has his baby teeth, therefore hard and big toys might not be advisable. You need to buy those soft plush toys or rubber balls that won’t put so much strain on his jaw. As he grows older, he will then be able to take on harder toys that are a bit more challenging to chew on. It is, therefore, important to consider this factor when you search for the right toy for your dog. Aside from age, you must also take note of the size of your dog. A smaller dog won’t usually like to play with a bigger dog’s toy because he most likely won’t like the size. Likewise, a small dog’s toy won’t be appealing to bigger dogs as well. You can usually ask the staff in a local pet store which dog toy is best for your dog’s size. You must consider the breed of your dog when buying a toy. Different breeds like different games and have different temperaments, so you might want to research on what your dog likes to do so you can buy him the right toy. Let me give you a few examples. A beagle, for instance, is referred to as a scent hound dog. This means he’s very inclined to scent. With that in mind, you might want to encourage him to hone his sense of smell. That said, beagles love toys that have different scents. If you have a beagle, you might want to buy various dog toys that have different smells. Another example is an Afghan hound, a good example of a sighthound dog. Sighthound dogs rely on their sight and speed, as opposed to scent hounds, thus the name. It is for this reason why sighthound dogs are very good hunters. Dogs who belong to this type usually like Frisbees or balls. Smaller and more intelligent dogs, on the other hand, want toys that are a bit more challenging. Terriers, for instance, enjoy mentally stimulating games. With that, you can buy your terrier a puzzle toy so that it can challenge itself a bit. The texture or toy material is really important to consider as not all dogs like the same texture. Some dogs like smoother and softer toys, while others like rough and hard ones. Generally, smaller dogs like smooth and soft toys, while bigger ones like the rougher toys. Of course, this rule isn’t totally set in stone, so you might want to do some research on what texture your dog likes. Alternatively, you can use its breed as the basis. 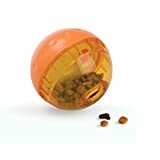 When we buy toy balls for our dogs, we want to make sure that these toy balls are totally safe to play with and are not made of any toxic substances. The Chuckit! Ultra ball is one of the best outdoor dog toys you can find that is made of natural rubber and is completely non-toxic for dogs. 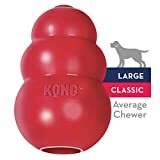 The Kong Classic Dog Toy is one of the most popular dog toys in the market and also one of the best dog toys for labs. As labs are pretty hard chewers, they need a big sized toy that can bounce and is a bit unpredictable. This toy is the answer to their needs as it is very durable and has a very unpredictable bouncing pattern. If you want to give your dog a cute little partner in crime that squeaks, then the ZippyPaws Skinny Peltz is what you need. It’s one of the best small dog toys you can give to your cute little buddy. 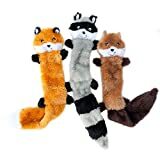 The ZippyPaws plush toy comes in three different characters: a squirrel, raccoon, and a fox. They each have a squeak machine inside to make cute little noises when squeezed. 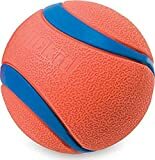 Aside from the Kong dog toy we mentioned earlier, there’s the Kong rubber ball extreme which is also a very cool toy for your dog. It can be used for playing fetch. 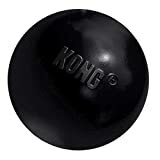 As the ball is made of natural rubber just like the Kong dog toy, it isn’t toxic. It’s also very durable and won’t deteriorate no matter how much your dog bites it. Dog bones are very popular among dogs because they have a nice flavor that appeals to them, not to mention they actually look like real bones. The Benebone Wishbone dog chew toy is one of the more popular dog bones in the market that’s made of real bacon! It also has a unique shape that allows dogs to grip it properly so that they can keep chewing on it. 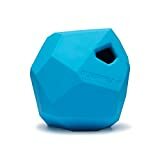 The Ourpets IQ treat ball is literally a ball that houses all of your dog’s treats inside. It allows your dog to eat in a rather fun way. Whenever your dog rolls the ball, the treats will come out. That way, your dog will kind of learn how to exercise every day because he can have an incentive to do so. This is a great toy for dogs who are rather lazy and don’t want to move around a lot. 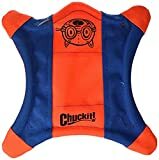 Another interesting product from ChuckIt, the Chuckit! Flying Squirrel is actually like a frisbee that you can throw around and let your dog catch. It also has the face of a squirrel on the front to make it look like an actual flying squirrel. This is a more educational toy that has four levels of difficulty where your dog has to do a challenge. It is designed for older dogs that like to have a challenging game instead of playing the ordinary game of catch. In the first level, your dog has to lift a cone. In the second level, he has to open the red drawers with the loops. In the 3rd level, he has to push the knob in the path so that the yellow drawers open. In the last level, your dog has to put the cones in the holes at the top. This cute, little stuffed dog is made more for helping your dog relax than to entertain it. It’s a great toy to give if your dog is aggressive or is whining all the time. It has a heartbeat-generating machine and a heat source to give it the feel of a real dog. It’s also non-toxic so you don’t have to worry about leaving it with your dog. This is actually the ideal toy for young hunting dogs who love to look for things. 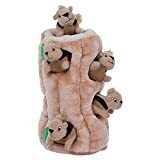 The toy comes with a tree stump and four cute little squeaking squirrels. It’s a very interactive game that allows your dog to train its sense of smell and sight. Plus, it’s not repetitive which means it’ll never get boring. This big chew bone by Nylabone is perfect for the larger dog breeds. These bones are made to be tough to cater to the strong jaws of big dogs like German shepherds and Golden Retrievers. Also, it comes in three different flavors: chicken, turkey, and knot. 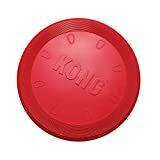 This is the third Kong product in this list. It’s the HDP Kong flyer which is a classic flying disc that you can play with your dog. It’s best used when you’re with your dog in the park as you can both get some exercise. This toy is like a treat ball but in the shape of a rock. Its design is very detailed and looks exactly like a rock that you can find on the ground – except it’s in a different color. Due to the unique structure, most dogs will wonder what it is and want to play with it. It also has a small hole where the treats can come out when rolled. If you want a different kind of ball, then you’ll probably enjoy this one. It can bounce very high and fast, thereby exciting your dog in the process. It is also recyclable and safe to use in the dishwasher. It is also totally non-toxic and safe for your dogs. If your dog likes to play tug of war, this is the toy to buy. As it is flexible and durable, your dog won’t be able to break it into two quite easily. It also has a very nice design which makes it appealing to your dog’s eyes. It’s also safe and doesn’t contain any toxic materials. You must already know your dog’s preference and chewing habits even before you go to the pet store to look for a toy. This will help you determine which dog toy you should buy. The best way to do this is to follow the buying guide that we’ve provided above. This is one of the most important things to do upon buying a dog toy. Surprisingly, a lot of people still take this step for granted. The reason why you should always inspect the newly bought toy before giving it to your dog is so that you can ensure that there are no small parts that can be ingested. If the toy has some small parts that can easily be bitten off and eaten, then you might want to reconsider giving the toy to your dog. These small parts, when in the body of your dog, can seriously harm him, especially if the parts are made of toxic materials. When introducing your dog to toys, don’t stick to just one toy. Buy a whole range of toys and fill up your dog’s toy box. Once you’ve bought several toys, maybe two or three, alternate them every day. If you give your dog the same toy every day, he’ll eventually get bored of it. To ensure that your dog won’t get bored, give him different toys to play with from time to time. Once your dog gets older, you may even teach him to get the toy that he wants from the toy box. If one of your dog’s toys is already broken or damaged, it might be about time to throw it away. Broken toys aren’t good for your dog because small and broken parts might be accidentally ingested. Other than that, you really wouldn’t want your dog to be chewing on a toy that’s falling apart anyway. Just make sure that you buy a new toy to replace the broken one. This will allow your dog to still have something to play with when his old toy is no longer there. Honestly, you won’t really know where your dog’s toys have gone. Your dog probably buried it somewhere in the backyard one time or flung it into the trashcan. In these places, the toy could have been filled with a lot of dirt, bacteria, germs, or other things that aren’t healthy for your pet. It is for this reason why you have to make sure that you clean your dog toys regularly. Twice a week is a minimum. If you can clean them once every two days, that’d be even better. When your dog starts playing new toys, he’ll need a lot of supervision because he most likely doesn’t know how to play with it yet. As such, you need to supervise your dog from time to time, especially if he’s still a puppy. Teach him how to play with the toy you bought, and also play along with him too. Once your dog gets older, you won’t need to supervise as much. Probably the only time where you’ll need to supervise is if you buy a new kind of toy that your dog hasn’t encountered before. Q: Are plush toys safe? A: Plush toys are really cute and actually pretty good for dogs. However, if your dog is big and has a really high chewing power, you may want to think twice about buying a plush toy. If your dog easily tears your plush toy apart, he might end up eating the stuffing as well – we don’t want that to happen. We suggest that you buy plush toys for dogs that are small to medium-sized and are not very aggressive chewers. For bigger sized dogs and aggressive chewers, the best indestructible dog toys are more suitable. Q: Why is rawhide bad for dogs? A: While rawhide bones don’t really have a lot of risks for your dog, there are certain consequences that your dog may experience if it regularly chews on its rawhide bone. One of the issues regarding raw is that it may contain toxic chemicals. This is because rawhide isn’t made of meat but is a byproduct of leather. That said, your dog is actually chewing on a leather bone if it constantly bites into rawhide. When the rawhide is taken to the tannery, it is usually dipped in chemicals to cleanse it and make it look good. Therefore, your dog is actually eating those cleansing chemicals. Q: What materials to avoid in dog toys? A: Aside from rawhide, we also recommend that you avoid stuffed animals with a poly-fil stuffing. A poly-fil stuffing is actually very dangerous to your dog if swallowed. Of course, dogs will most likely rip the stuffed animal apart. You might also want to avoid any toy that has metals such as balls with metal bells inside. Latex toys are also a no-no because they may cause rashes in some dogs. Lastly, try to keep your dog away from vinyl. Vinyl has a compound inside known as phthalate which can cause organ damage. Q: Can I use tennis balls as a dog toy? A: We definitely don’t recommend that you let your dog play with a tennis ball. Tennis balls are made of fuzz that can be a choking hazard if your dog likes to chew it and tear it apart. Also, the bigger dogs can chew the ball in half and swallow it even. If that happens, your dog will have an even bigger choking hazard. You may even need to bring your dog to the emergency vet if this happens. Therefore, we really advise against giving your dog a tennis ball for a toy. Q: What are the risks of tug-of-war toys? A: While playing tug of war with your dog is really fun, there are some risks that accompany this type of activity. First of all, dogs with dental problems or arthritis shouldn’t play tug of war. Since it is a very physical game, dogs who can’t do strenuous activity should refrain from playing it. Also, games like tug of war may bring out the aggressive side of your dog. Dogs that have aggressive tendencies may bite their owners or challenge them if their owners give up. If your dog has any history of aggression, we don’t recommend buying a tug of war toy. 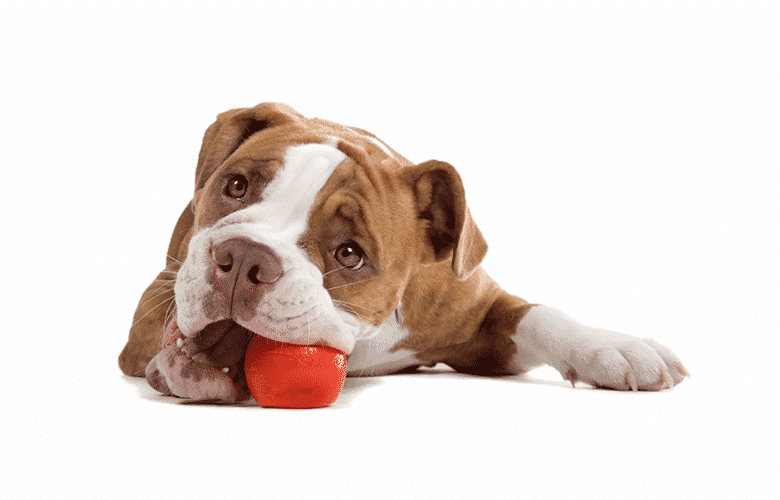 Are you ready to buy your dog a dog toy? Be ready with the right knowledge on dog toys so that you’ll know which dog toy suits your dog the best. As there are a lot of dog toys out there, you might be tempted to just buy the dog toy that looks the nicest. However, choosing the best dog toy for your dog is something that takes some careful consideration. This is why we’ve made a list of the most durable, safest, and most popular dog toys out there. We’ve also added a buying guide and a lot of other things that dog owners should find useful. All the brands mentioned here are tried, tested, and trusted so you’re assured of quality. You just have to pick a few dog toys from this list to add to your pet’s toy box.